MetroWest here we come! - Boston Speech Language Therapy in Brookline, MA 02445. 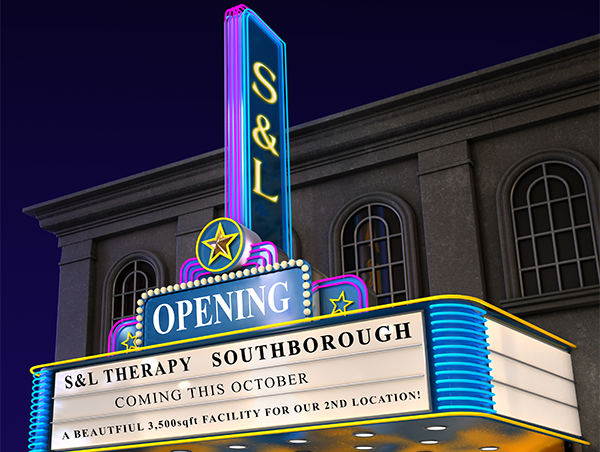 We are very excited to announce that S&L Therapy is opening a second location in Southborough, MA this October! The new clinic is conveniently located at 153 Cordaville Road (RT85), Southborough, MA 01772 at the intersection of RT85 and RT9, just minutes away from both 495 and the Masspike. Our new 3,500sqft facility enables us to bring to MetroWest the same unique therapeutic approach that we’ve brought to Brookline and Greater Boston. We will offer speech and language evaluations, individual and group therapy, and consultations for children from 12 months through 18 years of age. All services we currently offer in Brookline will also be available in Southborough. This beautiful and spacious location will be outfitted with our bright and zany décor that has become a hallmark of our Brookline location; bright and sunny over-sized treatment rooms, toys, games, books, as well as several new features. And YES, S&L Therapy Southborough will have an aquarium also! The waiting room will be the home of a brand new, custom made, 600 gallon aquarium where we anticipate the arrival of several new species of tropical fish. This huge oversized aquarium will be 8 feet long and 4 feet high! In typical S&L Therapy fashion, we are also planning on taking this opportunity to once again introduce some industry firsts with our second location. We will be implementing many new things, but one that we are particularly excited about is S&L Therapy’s Fantasy Café! We’ll have lots more details in future posts. We are looking forward to our expansion to MetroWest and welcome any referrals of friends or families who may benefit from our services! If you would like more information, please feel free to contact us via our website, www.sandltherapy.com.